The Association has always sought to be 'the voice of history'. While appealing to a large professional body of people, its emphasis early on was on those teaching history. Its first description of itself began, 'Teachers of History have long felt the need for some organisation to promote the study of that subject in schools, and to facilitate co-operation among those engaged in teaching it'. In its early growth it attracted at least one such existing body. In 1908 Liverpool History Teachers' Association 'agreed to consider themselves a branch of the Association'. The first Council of the Association had a third of its non-officer or vice president members drawn from schools, with its treasurer (1906-18) J.E. Morris teaching at Bedford School. In Nottingham the branch drew many of its officers and active members from University College, Nottingham (later Nottingham University) and from the High School. The Nottingham branch, unlike many others before the Second World War, was not frequently presided over by prominent clergymen. The exception was its second president (1914-20), the Reverend Herbert Lovell Clarke, Vicar of All Saints Nottingham, 1913-23 and later the Archdeacon of Leeds. He lectured to the branch on 'Napoleon and some Modern Comparisons' and secured as speakers the Very Rev. Canon W.J. Baigent (of Nottingham's Catholic cathedral; 1857-1930) on 'St Benedict' in December 1914, Canon Thomas Field (of Southwell; 1855-1936) on 'English Schools before the Reformation' in June 1915 and the Rev. Alfred Walter Frank Blunt (1879-1957) on 'The Early History of Christian Monasticism'. The first annual report of the branch noted that its programme had been 'arranged to interest, as far as possible, all classes of members'. Early on the branch placed much emphasis on the teaching of history. The first president (1911-14) was Dr George Sherbrooke Turpin (d.1948), the headmaster of the High School. Early joint secretaries were also from the High School: Miss M.C. Hargreaves (1911-14) and Miss W. Phillips (1914-25). In 1914, after an introductory talk by Professor T.F. Tout, a past president of the HA, the first lectures were on 'The Value of the Study of History' by Miss Powell of St Mary's College, Paddington, and 'Handwork in the Teaching of History' by Miss Matzinger of the Froebel Institute. The 1912-13 programme was heavily angled towards the teaching of history with three lectures on 'The Place of Documents in the Teaching of School History' (Mr M.W. Keatinge), 'Some Difficulties in Teaching Medieval History' (Miss Hilda Johnstone), 'The Relation of Ethics to the Teaching of History' (Mr Dixon Lee), discussions following a series of papers by members on 'How to Stimulate an Interest in the Study of History in Schools' plus the then HA President, Professor A.F. Pollard, lecturing on 'The Function of Historical Studies in the Newer Universities'. At the annual meeting the branch put on an exhibition of historical handwork which had been carried out in the local schools. The following year another exhibition of work was held while on two evenings there were performances of short historical plays written and performed by local school children. The attention to the teaching of history lapsed until 1923, when William Wyamar Vaughan (1865-1938), the headmaster of Rugby, led a discussion on some difficulties faced by teachers of history. In 1924-5 two of the four meetings were devoted to discussions on the problems in the teaching of history and in the next year Professor Owen, who had published Teaching of History in Elementary Schools (1916), chaired a discussion on 'The Aims of the Teaching of History'. Thereafter, until after the Second World War, such concerns were addressed mainly by lectures addressing broad historical issues. While issues of teaching history were a major early feature of the branch, the study of local history was equally prominent and stayed so longer. In the early period the leading figure was E.L. Guilford, later J.D. Chambers and Alan Rogers and more recently J.V. Beckett.4 Everard Guilford, a local person and a Cambridge graduate, was appointed a lecturer at University College in 1913 and, before going into the army, briefly succeeded Professor Dolley as a joint secretary of the branch. In the 1911-12 season he had lectured on 'Nottinghamshire Monasteries', the following year he guided members round Southwell Cathedral and in 1913-14 he lectured on 'the '45 in Nottinghamshire'. After his return from the war he spoke on 'The Surrender of Charles at Newark', 'Sports and Pastimes in the Middle Ages' and 'Fools of Gotham' (the last relating to a nearby village, not to New York!). Guilford left University College to become the first head of the BBC's Nottingham studio. As a local historian he put most of his voluntary efforts into the Thoroton Society, being its secretary 1920-5 and editing its Transactions, 1925-38. The branch's emphasis on local history was also determined by the early support it received from municipal figures. Alderman E.L. Manning served as branch treasurer from 1913 to 1916 and Alderman Mellors spoke on 'Some Trent-Side Villages' in 1912. Lectures on local history proved very popular. In 1913-14 the HA's treasurer, Dr J.E. Morris, attracted a large audience and stimulated much discussion with his lecture on 'The Study of Local History'. There was also keen interest in archaeological topics. Dr Felix Oswald (1866-1958) excavated the Roman Camp of Margidunum, near Bingham, between 1910 and 1936, and was made an honorary member of the Thoroton Society and later Honorary Reader in the History of Roman Britain in the University College. Oswald was also HA branch president, 1927-30. Yet generally the major forces which kept the branch going came from the History department and the High School. After Dolley's death Gladys Scott Thomson (d.1966) was Acting Head of the former (1916-20). Appointed as a lecturer in 1915, she went on to be a tutor at St Hugh's College, Oxford (1921-3) and archivist at Woburn Abbey (1927-40), publishing Lords Lieutenant in the Sixteenth Century (1923), Life in a Noble Household (1937) and other substantial books. She was notably active in the branch in 1916-20 giving lectures on 'Some Notes on the Cecil Mss in Hatfield House', 'A Mirror of Seventeenth Century Thought: Shorthouse's John Inglesant', 'The English in France in 1591' and 'Medieval Baron and English Squire' while returning to the branch to speak on 'The County in the Sixteenth Century' in 1922-3. During the later First World War she taught with Nina Brameld, who was appointed as a temporary lecturer in 1916. Nina Brameld and Professor Leonard Victor Davies Owen (1888-1952) were the leading figures in the branch for much of the interwar period. Brameld was a Tudor specialist, whose 1915 Nottingham MA thesis was published as Local Government under the Tudors (1916). She rarely lectured to the branch - speaking on 'Some aspects of municipal life in the Sixteenth Century' (1921-2) and 'The Tudor Period' (1934-5) - but appears to have been the key person in keeping the branch going. She served as secretary (at first joint secretary) from 1915-16 to 1931 and as president, 1931-42. In the Second World War she was active in the Women's Voluntary Service and the branch lapsed into inactivity between 1939 and 1943. Professor Owen, who was Professor of History at Nottingham from 1920 to 1951, was an amiable polymath who projected an image of an old-fashioned Oxford professor. At Oxford he had won the Stanhope prize for his essay published as England and Burgundy 1400-1450 (1909) and subsequently published 'England and the Low Countries 1405-1413' in English Historical Review (1913). Arriving via Bangor and Sheffield, he launched into a major project surveying Nottinghamshire and other East Midlands place names. In spite of his Medieval expertise, when he introduced a special subject in 1948 he taught 'The French Revolution'. He showed a somewhat similar range in his near annual lectures to the Nottingham branch. These ran from 'Greek and Medieval City States' (1931-2), 'Hadrian's Wall' (1926-7) and 'Robin Hood' (1937-8) to 'The History of History' (1922-3), 'Historical Evidence' (1925-6) and 'Historical Forgeries and Fallacies' (1928-9). He did lecture on 'The Relations between England and Flanders during the later Middle Ages' (1921-2) and 'Place Names and the Study of History' (1932-33), his specialisms. 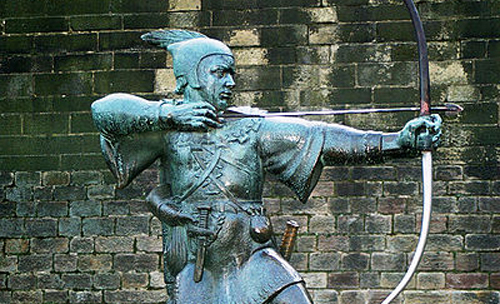 He also wrote a significant essay on Robin Hood, a topic also taken up memorably by one of his successors as Professor and as a branch member, Sir James Holt, with his book Robin Hood (1982). Owen lectured to other HA branches. He also devoted much time to the Thoroton Society, jointly editing its Transactions (with A.C. Wood) from 1938 until his retirement in 1951. Owen's successor as Head of Department and Professor of Modern History (1951-60) was Alfred Cecil Wood (1896-1968). Appointed as a lecturer in 1925, he was branch treasurer (1926-31) and lectured to it on 'Gladstone', 'Queen Victoria' and 'The Seventeenth Century'. His many books included Nottinghamshire in the Civil War (1937) and History of Nottinghamshire (1947). Wood's major interest was local history and he pursued it more in the Thoroton Society, of which he was President, 1958-61, and editor of its Transactions, 1938-59, than in the HA. The other early major figure was J.D. Chambers (1898-1970), who had graduated from Nottingham in 1920. He was still working on a doctorate under Professor Owen when, in 1925-6, he gave a lecture on 'The Nottinghamshire Parish in the Eighteenth Century'. In 1930-1 he spoke on 'The Open Fields of Laxton, Nottinghamshire', the subject of a book by him in 1964 and, later, by another one of his successors as a professor and Nottingham branch member, John Beckett. Chambers worked in the University College's Adult Education department, 1927-40, returning as a lecturer in economic history in 1947, later Professor of Economic and Social History (1958-64). Chambers was highly influential in the 1930s with his Local History Group, which affiliated to the HA branch and all its members joining the HA. After the Second World War Chambers lectured to the branch and was branch president from the late 1950s to 1969 and served on the HA's Council 1965-8. He was also active in the Thoroton Society, both writing for its Transactions and joining its Council in 1959 and becoming a vice president in 1961.6 Others were influenced by Chambers and his approach to history, including W.E. Tate (who lectured to the Nottingham HA branch) and Arthur Cossons, of Chambers' Local History Group. With the many links between the HA branch, the Thoroton Society and other learned societies it is not surprising that a feature of the 1930s was frequent joint lectures and excursions. This also made sense when membership dipped. There were 40 members in 1932-3 and 29 in 1937-8, with membership peaking in the immediate post-war period at 110 in 1949-50. In the mid-1930s the branch was holding annual meetings with the local branch of the Geographical Association and in 1934-5 a 'federation of local societies' was under consideration. Links with the archaeologists were sufficiently strong for the HA branch to nominate two of its members to the council of the new archaeological society. The Nottingham branch before the Second World War operated in an interconnected group of people and learned societies. 1. As the Plymouth branch (1906-11) was the first to close and the Bedford branch was not active until 1920, it might be deemed to be the HA's thirteenth when it was formed. HA, Fifth Annual Report 1910-11 (1912), p.10. The other annual reports, copies located in the Historical Association Papers in Nottingham University Hallward Library, Manuscripts and Special Collections, are the major source for this essay. 2. He died on 1st July 1917. A.C. Wood, A History of the University College of Nottingham, 1881-1948, Oxford, Blackwell, 1953, pp.58, 60, 66 and 70. 3. John Beckett (ed. ), The Thoroton Society. A Commemoration of its first 100 Years, Nottingham, Thoroton Society, 1997, pp. 1, 10-11, 18, 22 and 36. 4. For the University College, then Nottingham University, History Department see Michael Jones, John Beckett and David Green, History At Nottingham, Nottingham, University of Nottingham, 1995. 5. J.M. Dickinson, 'Thompson, Alexander Hamilton', DNB. 6. Beckett (ed. ), Thoroton, p.27. 7. Cosson's son, Sir Neil, was awarded the Medlicott medal for History and lectured at the HA's centenary conference in Nottingham, April 2006. Chris Wrigley is Professor of Modern British History at Nottingham University and former President of the Historical Association (1996-99).